Living in a pineapple under the sea is so 2010. Artist Stephen Turner recently took up residence in a wooden egg on the River Beaulieu in England, where he will stay for about a year. 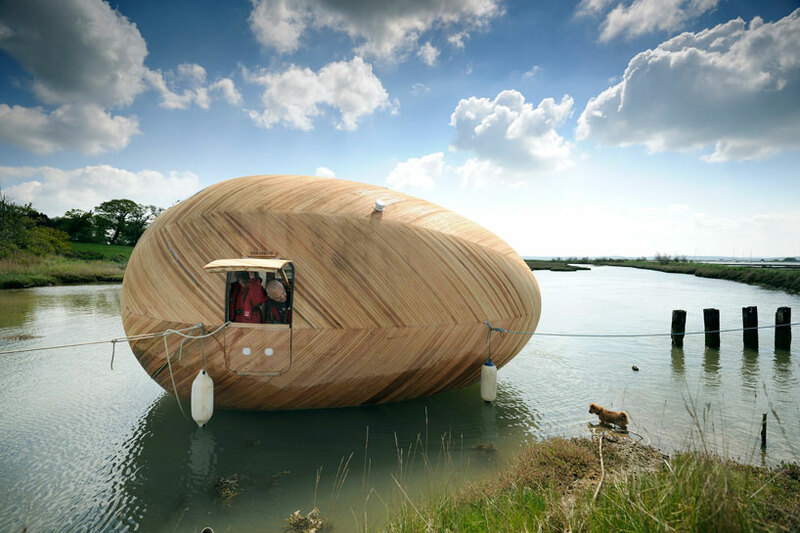 The Exbury Egg, Turner’s new home, is a solar-powered wooden pod which is tethered like a boat in an estuary, rising and falling with the tide. The main idea of the Egg is to explore “a more empathic relationship with nature” linked more closely with the rhythms of natural life. However, the project does not reject modern technologies but rather seeks to use them in the most effective possible way. For instance, Turner has a computer and phone powered by solar panels. The Egg itself is a thing of beauty (you can see photos and video of its construction here), designed and built to withstand the elements but also to become weathered by them, unlike a metal or fiberglass vessel. Stephen Turner is writing a blog about his experiences in the Egg and there is an extensive program of seminars and educational events related to the project, which runs through July 2014. This entry was posted in The Art of Science and tagged climate change art, exbury egg, science art, stephen turner. Bookmark the permalink. Looks like something that would be in ‘Dwell’ magazine!